The efficient, computer aided or automatic generation of quad layouts, i.e. the partitioning of an object’s surface into simple networks of conforming quadrilateral patches, is a task that – despite its importance and utility in Computer Graphics and Geometric Modeling – received relatively low attention in the past. 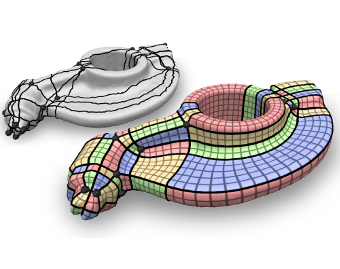 As a consequence, this task is most often performed manually by well-trained experts in practice, where quad layouts are of particular interest for surface representation and parameterization tasks. Deeper analysis reveals the inherent complexity of this problem, which might be one of the underlying reasons for this situation. In this thesis we investigate the structure of the problem and the commonly relevant quality criteria. Based on this we develop novel efficient solution strategies and algorithms for the generation of high quality quad layouts. In particular, we present a fully automatic as well as an interactive pipeline for this task. Both are based on splitting the hard problem into sub-problems with a simpler structure each. For each sub-problem we design efficient, custom-tailored optimization algorithms motivated by the geometric nature of these problems. In this process we pay attention to compatibility, such that these algorithms can be applied in sequence, forming the stages of efficient quad layouting pipelines.